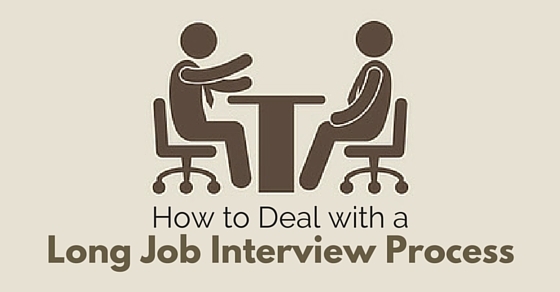 How to Deal With a Long Job Interview or Hiring Process? Many employers hire employees through a long job interview process to analyze each individual’s skill and ability. If they hire for a senior level position definitely there will be a long interview process. They check your attitude and passion towards the job they are offering, how much stability they show up to settle into their job, how long they can serve the company and how much positive you are towards their company work culture. Here are a few interview preparation tips to follow when attending a long job interview process. Some of the main elements to consider while dealing with a long job interview process. It is possible that most of the time while facing some of the longest job interview process, a candidate experiences restlessness and which triggers his patience. But the candidate is put through such a long process to check their patience level. The following mentioned are few job interview tips to prepare for a a long interview process or hiring process. While applying for a job, a candidate needs to check the eligibility criteria for that job. A candidate should think before applying for a job that whether he / she is eligible to apply for such kinds of job. Sometimes it is possible that most of the interview, which is holding a lower level position may end within an hour time of the interview process, but other interviews such as high profile interviews take a bit long time to reach its end process. Candidates can take help of some of the references to avoid such long interview process. By asking someone working in that company to recommend them to that job interview can save some time in the interview process. These referral helps in reducing job interview process which can be helpful in using such time in another healthy or useful matter. Therefore, a candidate can use some referral for his / her job’s sake. While preparing a resume a candidate should make sure that all the matters entered in the resume are truthful and precise. Sometimes it happens that most of the candidates think that an interviewer can be impressed with well written descriptive resume patterns, but nowadays it is big no. As an interviewer is interested in such resume which used latest resume pattern and which added minimal but precise information about oneself. Therefore, it would be good if a candidate keeps this in mind for future use. While applying for a job a candidate needs to understand the presentations given by the employer to cultivate reduction of wastage of time. When a candidate understands the main information about the given job description regarding the job profile, this understanding ability can save certain time of the interview process. Therefore, it is very important to know all the essential elements involved in that job description before applying for such job profiles. Whenever a candidate approaches an employer, he / she should approach with a right attitude. Sometimes it happens in the interview that a candidate approaches an employer with a wrong attitude and makes everything confusing to the employer then at that time it is possible that the interviewer may take a little long time to understand the approach that a candidate delivered on him / her. And ultimately it creates an environment for the candidates which is impatient and unfavorable in terms of the interview process. While entering an interview process a candidate need to understand all the main elements which is important for any kind of interview from head to toe. It is even possible that a candidate experiences a low level of confidence in their interview while answering interview questions. Therefore, to save the time of the employer and the company it is necessary that a candidate understand the value of his/her own confidence while answering job interview questions and this confidence can also reflect in their interview selection process. An interview process consists of different levels of interview rounds. And these levels of interview can only be cleared if a candidate applying for such post is capable enough to handle such position. There are normally written test, a group discussion and personal interview. If a candidate participates in these levels very actively then there is a possibility that a candidate can be selected for the position without any extra time. Therefore, it is always better to participate actively in all the group discussion to create an impression on the company. While explaining your answers to the question of the interviewer, it is necessary to understand only one thing that while answering, a candidate need to be honest when presenting himself / herself in front the interviewing panel. And create an impression that you are supposed to be the best choice that they can make for their company. Therefore, it is very important to know that being honest can create an impression over any kind of interview or job hiring process. The interview panel expects some of the qualities to be existed in his / her selected candidate. Therefore, to present their impression of perfect candidate, an interviewee need to be patient in all the situations. Being patient can bring you a position where a candidate tries to be a part of his /her dream company. Sometimes it even happens that an employer puts a candidate in such impatient situation to judge his/her patience level, to be sure about the presentation of the candidate in the interview process. While explaining your answers to the question of the interviewer, it is necessary to understand to never be nervous in front of the panel interview. Because if a person presents his / her nervousness in front of the interview panel then it is possible that they judge yourself as a very nervous person. Even if you are nervous, try to act as cool and avoid showing nervousness to your interviewer. A candidate should have some information about the interviewing company. By researching the details about the interviewing company, a candidate can create an impression which can be favorable for him/her to start their professional career in that particular company. Therefore, it is always better to start collecting all the details about the interviewing company to be sure of all the interview related questions. Before applying for a job, a candidate need to be sure of his/her strengths and weaknesses. Because it mostly happens in all the interviews that a candidate trying to grab that opportunity by getting selected for that particular job, it is necessary to understand the strengths and weaknesses of a candidate. Therefore, a candidate knowing his / her own strengths and weakness can project himself/herself in a better manner and it can also be helpful in clearing all the interview process. When a candidate gets approved by his / her job or position in that interviewing company, he/she never discusses the salary or other working locations kind of information with the employer while in the interviewing process. This can create a wrong impression about the candidates working nature and it can turn things worse for that candidate. Therefore, a candidate should always remember never to discuss salary negotiation and other work location related details with the employer of the company. Whenever an employer tries to ask you some questions, a candidate need to be quick and smart while answering such questions. It is a possible nature that an employer expects in his/her prefect candidate. Therefore, it is very important that a candidate need to be well qualified to answer all kinds of questions to prove himself / herself strong and smart in that job interview process. While applying for a job try to keep yourself calm, so that there won’t be any additional stress on yourself. Sometimes it happens that a candidate is trying to increase his / her chances of getting a job by applying more than a job, but ultimately the candidate instead of getting into the job, will get stressed because of the continuous interview processes. Therefore, to calm oneself, it is better that a candidate attends one job interview at a time. While attending an interview a candidate can present himself / herself as an enthusiastic person. His/her enthusiasm about the job can create a positive impression to the interviewer panel. It is better if a person applying for a job should be an enthusiastic about his / her job. Therefore, it is always better if a person presents some kind of enthusiasm about his / her job in that particular company to avoid negative elements. While applying for a job try to keep yourself calm, so that there won’t be any additional stress on yourself. Because it mostly happens in all the interviews that a candidate trying to grab that opportunity by getting selected for that particular job. It is necessary to understand the strengths and weaknesses of a candidate. Therefore, a candidate need to be sure of his / her inabilities that he / she is not ready to present it in front of the employer. And it is a great idea that a candidate never should show his / her inabilities in front of anybody which can turn things in a very pitying manner. After the session of interview process, a candidate need to show some courtesy to the interviewing panel by showing some gratitude about their time. And before leaving the interview room, a candidate need to thank all the employers who has been present in that interviewing process. Therefore, it is always better to receive some kind of gratitude towards them. And an interviewer need to be thanked for the sake of the company for which he / she is responsible to choose a perfect candidate. To end this discussion about the job interview process, we would suggest all the candidates and all the employers that a company needs an employee who can deliver the work or duty which has been assigned. And an employer need to be a person who should take responsibility for his/ her employees and try to keep everything on track. And through these interview process a candidate need to understand the job description which can narrow down everything to a level, where a candidate understands the needs and wants of the employer. Therefore, a candidate should start following all the above mentioned techniques to keep his / her job interview process short and brief without any wastage of employers and the company’s time. Next articleWhy is Quitting a Job so Hard in Different Situations?